A long time ago in a very, very small village in the east of Ireland (Ballymore Eustace, population 800) a lad of 9 years, profoundly affected after seeing Star Wars in the cinema, began compulsively drawing the comic of the film. A work of 200 pages, it was an obsession of over four years. However, for more than three decades those recycled pages from his dad’s office, drawn with biros and cheap markers, rested on the top of the wardrobe in the family home. 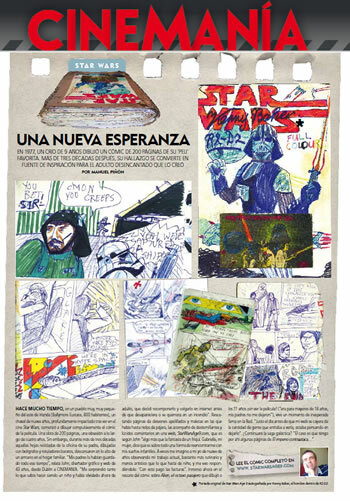 “My parents kept them all this time” says John, 43 year old graphic and web designer from Dublin, to Cinemanía. Immersed now in the rescue of the comic about Alien, the eighth passenger, which he drew at 11 years of age without seeing the film! (“It was rated over 18 and my parents would not let me”), (it) lives a moment of unexpected fame on the Internet. “Just the day before my web site crashed because of the amount of people that entered to see it, I was thinking of giving up”.